Conservatories are fantastic – the outside, inside! However, what if you want to read a book, or do some work on your laptop? Adjusting shade can be a useful feature to have! Many people contact us for window shutters in their home, only to find in our free consultation that other windows they may not have dreamed were possible for shutters, in fact actually are! In fact in a recent review, a customer had been directly told by other shutter companies that her windows looked impossible to add shutters to. We believe our consultants and installers are the best of the best as clearly shown in this fantastic conservatory shutter installation in Buckinghamshire. Goes to show it’s certainly always worth contacting Shutterly Fabulous for your difficult windows for shutters! 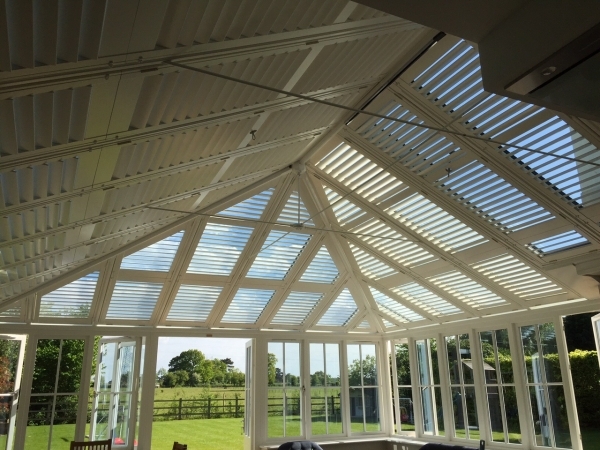 A fantastic system of interlocking custom panels has been created to give an incredibly unique look to this gorgeous conservatory. 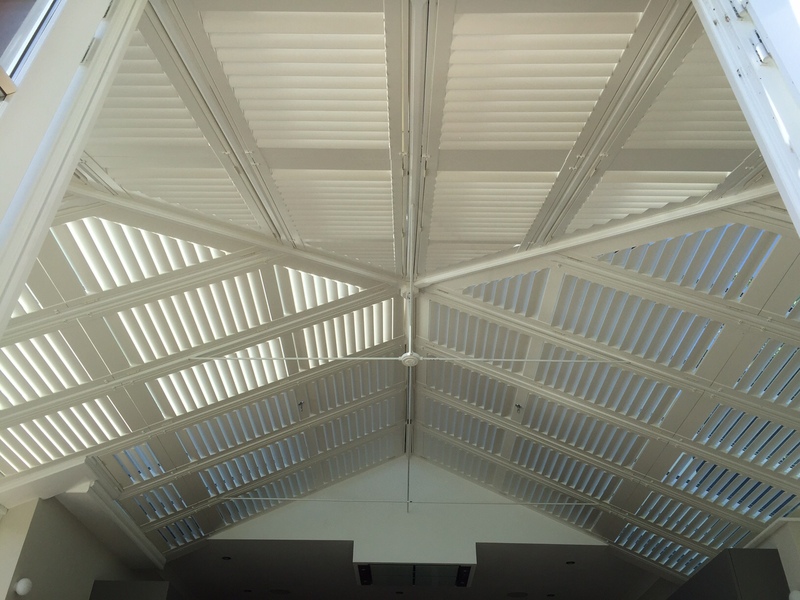 Precise measurements and a team of our expert installers worked to make these custom shutters one of the most impressive installations we have seen. The installation itself was constructed in strong poplar hardwood and finished in a silk white colour. Push-rods have been concealed and instead an open-sky appearance has been used leading to a clean and minimal shutter look. Another strong option for conservatories are our relatively new waterproof shutters. These work best in rooms where moisture may be an added factor – for example if a pool or water feature is present.